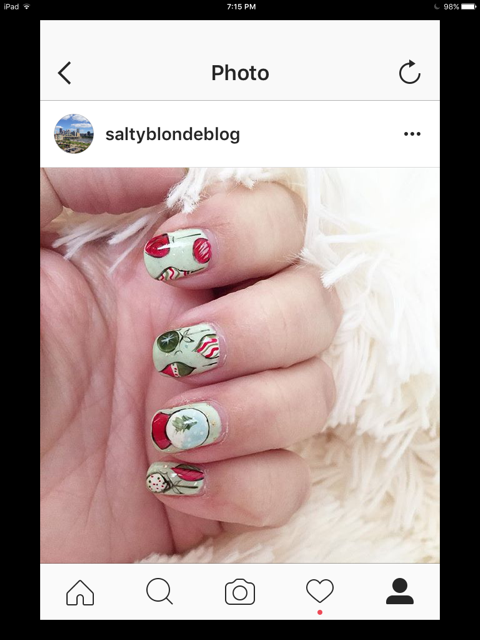 I love to go crazy with my nails for Christmas and thought you might want to see some nail art I’ve sported last and this year! All nail art on my nails was done at Dallas Beauty Lounge in Pittsburgh, PA. My very favorite place to get nail art! 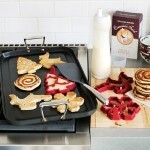 I’ve never brought in an idea that they couldn’t create and make even better! I went in to last my nail appointment all set to get these and ended up getting something different at the last minute. These are still in the running for my final appointment before Christmas. Originally found here. 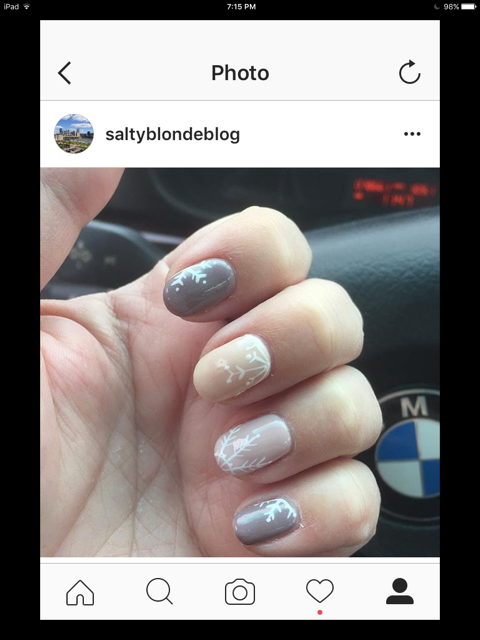 These snowflake nails are what I ended up with at my last appointment. I love them! Super subtle ode to the season that’s easy to wear everyday! Nail art by Kalynn at Dallas Beauty Lounge in Pittsburgh, Pa. 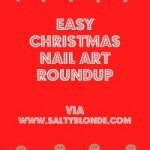 These whimsical ornament/snow globe nails were some of my faves from last year. I came in with a couple of different ideas and Kate from Dallas Beauty Lounge combined them into these! These chalkboard nails were so adorable in person! Kate from Dallas Beauty Lounge did a fantastic job in creating these for me! 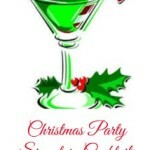 I need your help in deciding what to get for my last appointment before Christmas! The first idea is at the top of this post and here’s a couple more. As usual, I pulled these ideas from Instagram. 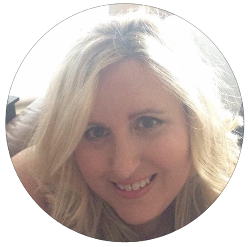 Give me a follow here. Let me know in the comments which you think I should get! 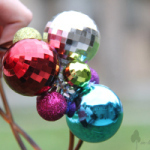 These are a strong contender! 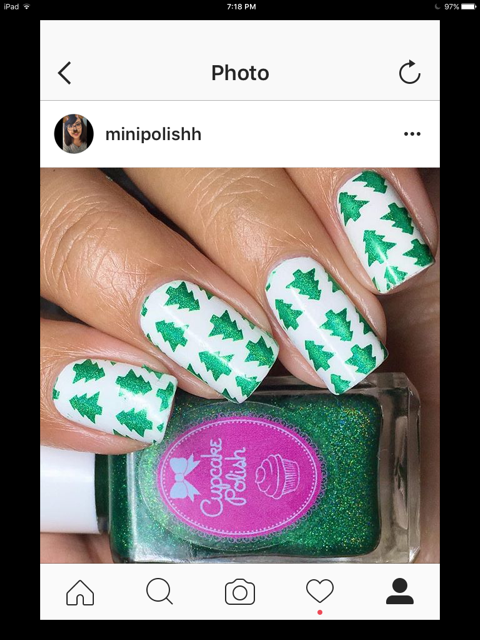 I love the Christmas tree on top of the car image in general, so to see it recreated on nails made me squee! 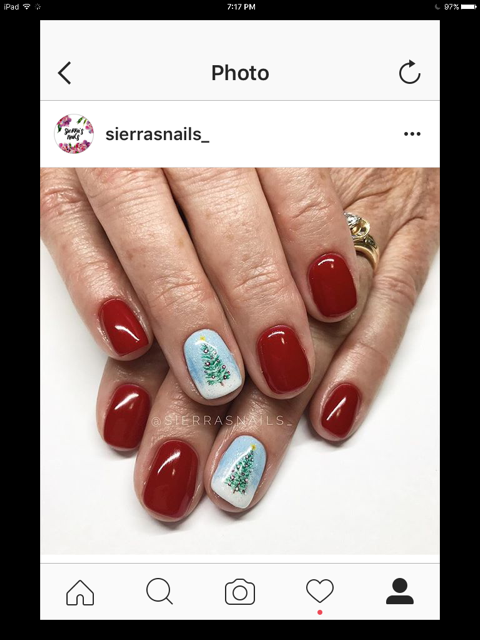 Nail art by Sierrasnails via Instagram. This gorgeous Christmas tree caught my eye on Instagram. I love the impact of it on one nail versus having a bunch of images on various nails. Would be lovely with hunter green nails too. 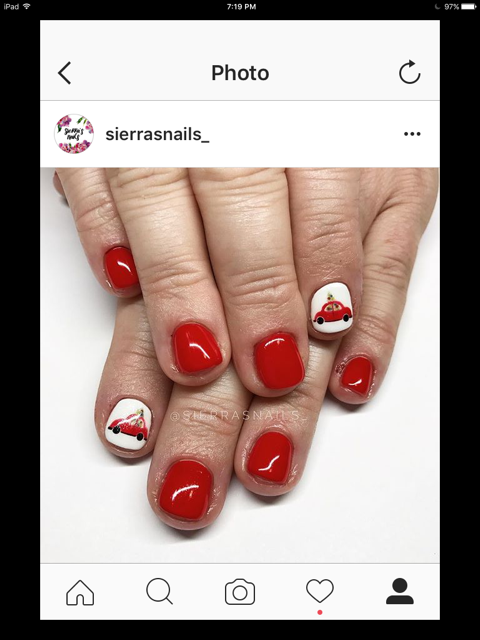 Nail art by Sierrasnails via Instagram. 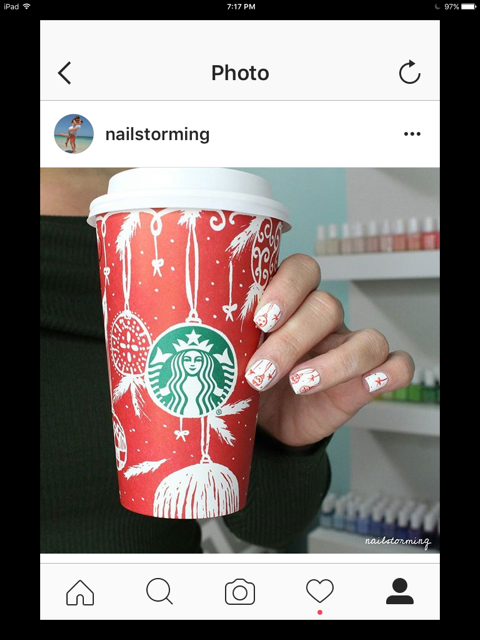 This Starbucks cup inspired art by Nailstorming is reminiscent of my own ornament nail art, but I like the simplicity of this being just red and white. 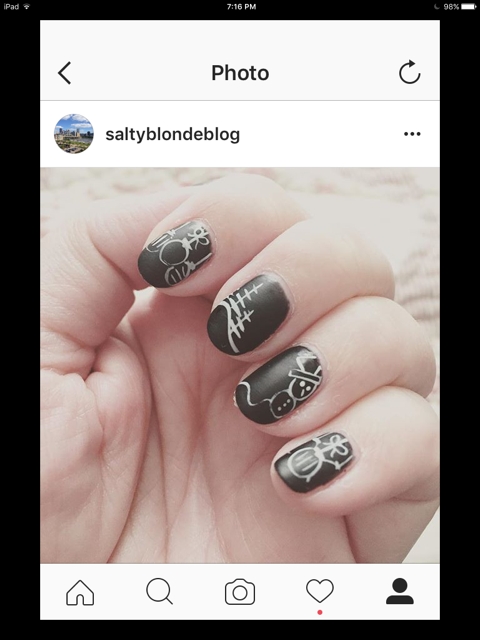 Nail art by Nailstorming via Instagram. I love these teeny tiny Christmas trees and I think paired with tiny candy canes would be really cute! I am super into the teeny tiny designs, so this could be a winner. Nail art by Minipolishh via Instagram. Which one do you think I should pick? Let me know in the comments !